It is appropriate to provide that binding tariff information issued in respect of the goods concerned by this Regulation which does not conform to this Regulation may, for a certain period, continue to be invoked by the holder in accordance with Article 12(6) of Council Regulation (EEC) No 2913/92 (2). That period should be set at 3 months. Binding tariff information which does not conform to this Regulation may continue to be invoked in accordance with Article 12(6) of Regulation (EEC) No 2913/92 for a period of 3 months from the date of entry into force of this Regulation. Done at Brussels, 19 May 2015. An article in the shape of a human skull made of plastics, measuring approximately 9 × 11 × 7 cm. 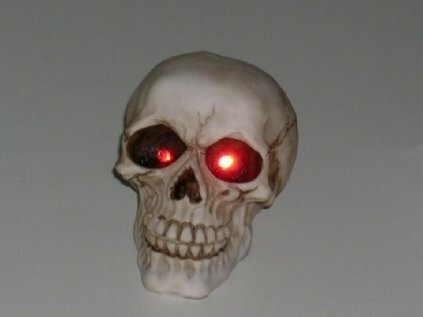 It contains flashing light emitting diodes (LEDs) that are powered by a battery and are embedded in the eye sockets of the skull and can be turned on and off using a switch at the base of the article. Classification is determined by general rules 1, 3(b) and 6 for the interpretation of the Combined Nomenclature (GIR) and by the wording of CN codes 3926 and 3926 40 00 . The article cannot be classified as a lamp under heading 9405 , because it is not primarily designed to illuminate a room, nor is it a specialised lamp (see also the Harmonised System Explanatory Notes (HSEN) to heading 9405 , (I), (1) and (3)). According to its objective characteristics, the article is not exclusively designed as a festive article (see also the Explanatory notes to the Combined Nomenclature to heading 9505 ). It can be used as decoration throughout the year. Classification under heading 9505 as a festive article is therefore also excluded. The article is made up of different components within the meaning of GIR 3(b). It consists of a component in the shape of a human skull made of plastics and battery powered LED lights, which together form a whole (see also the HSEN to GIR 3(b), (IX)). Due to its objective characteristics, the article is mainly designed for ornamental use. The illumination is only an additional effect enhancing the ornamental use. Consequently, the component in the shape of a human skull made of plastics is the component that gives the article its essential character within the meaning of GIR 3(b). The article is therefore to be classified under CN code 3926 40 00 as other ornamental articles of plastics. (*) The photograph is purely for information.